Sweetwater Ranch, the home of Nancy Adams located in Applegate Oregon, was the first stop on the Northwest tour. My sister, who traveled with me throughout most of the Northwest, and I were invited to stay several days with Nancy. At the time of the her invitation I was thankful to be put up for a few days, but I didn’t know until I was there just how much of an impact it would have on our interview process and how lucky I was to have that opportunity. We arrived in the late afternoon and were warmly received by Nancy; she promptly took good care of us in our road-weary state. While I was of course excited to meet her, she is a long-time friend of my sister’s, I was really excited to meet her animals. 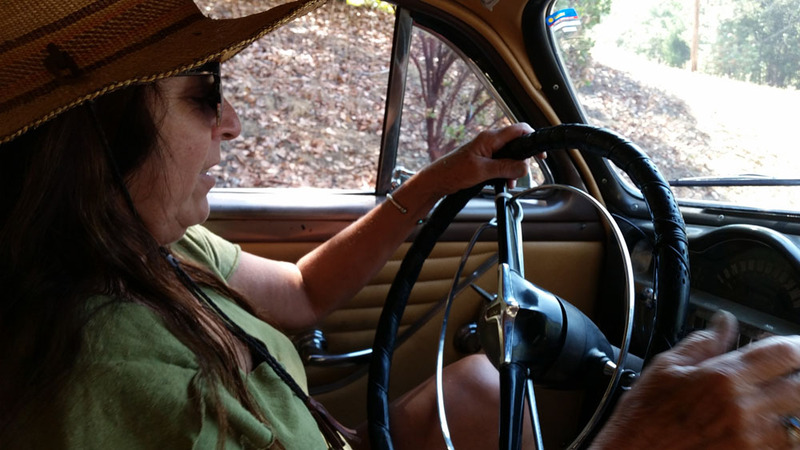 She lives on a 160 acre ranch that is home to 3 horses, 2 dogs, and 1 cat. Even though I live in the city, I am a farm girl at heart and because I don’t have any pets right now I especially enjoy my time with animals. I have a thing for heelers and she has two - a blue one and a red one - and they were both utterly delightful. Rosco, a young red heeler, took us on a walk through the woods around the house - because that’s what heelers do, they take you for a walk. And Betty, the Grande Dame of Sweetwater as I began calling her, made sure we stayed on the porch much of the time where she could keep an eye on us. We dutifully obeyed because it was too hot to do much of anything except sip beer and watch the sunset. Every morning Nancy takes one of her horses for ride through the network of trails on her ranch. The morning of our interview a friend joined her as well. It was fun watching her prepare the horses and gallop away. She rides with such grace and ease, I couldn’t help wanting to ride as well. After she returned from her morning ride, she graciously gave me a lesson and let me ride around a bit. It was so fun and made want to take up horseback riding. Because she is so at home on a horse, I couldn’t help but to wish that we could conduct our interview riding around the ranch! Nancy was born and raised in San Francisco and I enjoyed hearing her talk about her experiences in the Bay Area in the 50s and 60s. While other girls her age in high school were chasing boys and finding the perfect lipstick, Nancy wanted horseback riding gear and was taking the bus or cable car to one of the city’s many art museums. She lived in a house with parents that fully supported and encouraged her creativity. Her mother Olga was a true product of a traditional Kansas farm upbringing; she was self-sufficient, made all of her clothes, used everything at her disposal to create things, and cultivated strong curiosity in her daughter. These qualities were clearly passed on to Nancy and contributed to the wonderful artist she has become. 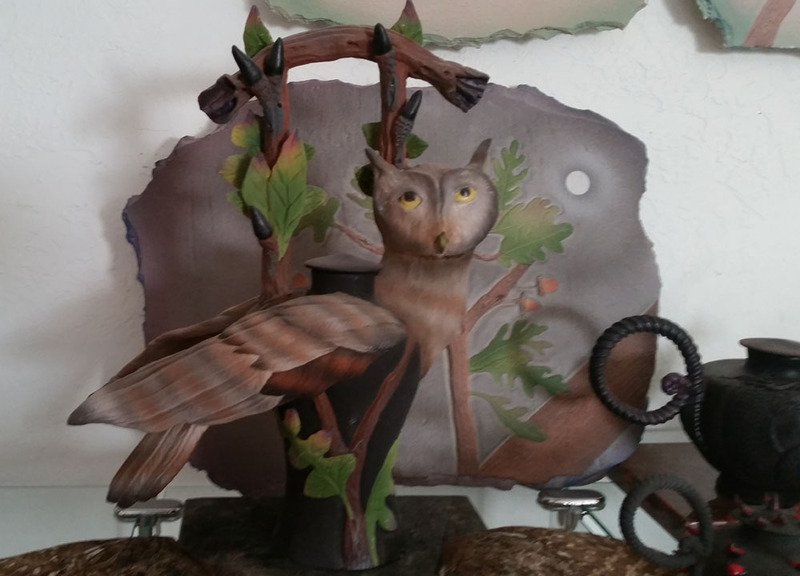 Nancy beautifully and easily reflects her natural surroundings by incorporating both the real and the mystical into her pottery. I also enjoyed listening to her tell how she got her start making a living selling her work. While she was attending City College in San Francisco a group show had been put together and was on public display. She went into class one day and her teacher reported, with much dismay, that one of the display cases had been broken into and her piece was stolen. Nancy, however, was not dismayed. Not only was she pleased that her piece was the only one stolen but quickly figured that if someone would steal her work then likely someone else out there would actually buy it. She quickly got to work. She first started making miniature bottles and covered bowls. I was happy that she still had some of those old to show me. Before she had her own kiln she would pack them up in egg containers and take the bus across the city to a friend’s studio and have them fired there. While she sold pieces here and there, things really took off for her when she started selling at the Renaissance Pleasure Faire in Marin. In fact, her first show there she sold out of everything. Before we met, Nancy shared the sweet story of how her parents met. They had been “set up,” so to speak, as pen pals by a mutual friend during World War II. They wrote to each other throughout the entire war. When her father returned to San Francisco after the war he made arrangements for Olga to visit - it was the first time she had left her town in Kansas. She was working as a journalist for the local paper and documented her trip across the Rockies which was subsequently published. I was overjoyed when Nancy told me that she still had a copy of that article. And a postscript on the story - her father had paid another soldier to write the letters because he was shy about his writing because he had only made it through the 8th grade. I love that Olga clearly didn’t care and loved him for who he was. There has been a steep learning curve throughout this whole project. I’ve had all kinds of glitches and have had to assess and re-assess things a number of times - all while traveling. One thing I learned is that interviewing in the summer and heat is really hard. It was really hot while we were at Nancy’s and she didn’t have air conditioning. Not only is it difficult to just sit for an extended period and talk while it’s hot, fans and air conditioners - prevalent when it’s hot - create all kinds of extraneous noise. This gave me one of my first hard lessons in audio recording - its biggest enemy is simply air. We did two sessions - the first we did ok but after we took a break it got progressively hotter, and by the second session we were melting. In hindsight I should have shut it down and asked if we could continue the following morning, when it would be cooler. But I felt like we were on a roll so we kept going. Nancy wanted to turn on a fan - I did an initial sound check and it seemed fine but when I went back to listen to it I found part 2 virtually unusable because of the moving air hitting the mics, which is a really, really terrible sound. I am cleaning it up as best so I can at least take notes on what was missed...and then I will go begging Nancy for a repeat interview! Sign up to receive the Artstories Newsletter! It includes updates on the project, additional information on the artists I'll be interviewing, highlights existing oral history projects, and other tidbits on history - art and beyond! I promise not to sell or give away your email address. Unsubscribe anytime.